As we live through this fast paced and rapidly changing world, each one of us may recall wonderful and nostalgic times of the past. This anecdote concerns a diverse group that was passionate about the noble and exhilarating sport of surfing and goes back to the period from mid 1960s to the early1970s. The “surfing gang” in the early days included Faiz Ahmed, Anil Amarasekera, Wendell Flamer Caldera, Jan Prins, Asita Tennekoon, Jan Vanden Driesen and the writer. Peter Dharmaratne, Gihan Jayatileka, Cedric Martenstyn and Niranjan Sinnatamby were part timers while new enthusiasts Astika Botejue (writer’s brother) and Ananda Ranasinghe joined the fray later. The common bond that brought us together was the love of aquatic sports - whether in a pool, lake or ocean and the outdoors. Some of us were competitive swimmers, water polo players and volunteer lifeguards on weekends at the beach in Mount Lavinia.Besides swimming, we had all mastered the art of body surfing and would enjoy the excitement of timing the sprinted swim to catch the waves at Mount Lavinia. While enjoying this pursuit we would watch with awe as Pat Guinan, a regular yachtsman and ocean enthusiast used a surf kayak to ride the waves. A surf kayak is a small board-like craft with foot straps. You sit on it with feet secured in the straps and use a paddle to propel and steer. Pat, who was later to become Commodore of the Royal Madras Yacht Club and then Commodore of the Royal Colombo Yacht Club, taught us the art of using the kayak to ride waves. Soon some of us had mastered this pursuit as well. As we became more daring, the kayak was used as a surfboard with the arms replacing the paddles for propulsive power. Riding the waves while standing on the kayak was a dangerous pursuit since a fall from a wave (called a wipe out in surfer jargon) would end with both body and cumbersome kayak rolling in the same surf. Luckily there were no major injuries to report. Peter Dharmaratne had other ideas. He created a surfboard of his own, crudely made of wood, which was an extremely heavy monstrosity that belonged to the age of The Flintstones. I recall Peter trying out his board at Mount Lavinia. He fell repeatedly while attempting to ride the waves. Thankfully the piece of lovingly crafted lumber did not hit him on the head during one of the spills! It was about this time that the legendary Englishman Mike Wilson appeared on our horizon. He turned up at the Surf Club in Mount Lavinia to meet some of us “surfing types”. Mike was an ex-paratrooper, adventurer, diver, film maker, etc. Some years earlier, he led a team that discovered a 250-year-old shipwreck six miles off the southern coast of Sri Lanka, in the Great Basses (the underwater expedition was described in Sir Arthur C. Clarke’s non-fiction book, The Treasure of the Great Reef). Mike arranged to show a surfing movie called ‘Locked In’ at the Otter Aquatic Club where some of the gang were active members. Mike knew we were hooked when he observed us watching with gleeful amazement as the footage of surfers taking off on giant Hawaiian waves rolled on. He then planned a surfing trip down the south coast and both Jans (Prins and Vanden Driesen) and the writer packed into his VW van with four surfboards strapped to the roof rack. Our first outing was at a location off Ahangama. Mike convinced Sir Arthur - his business partner - to accompany us on the trip. Sir Arthur brought his Questar celestial telescope and took pictures of us from the shore. Mike’s fibre glass boards were referred to as "elephant guns" because they were long, heavy and unwieldy. These were no ordinary boards. The best board in Mike’s collection was shaped by Greg Noll, a legendary big wave surfer from California. Naturally each one of us wanted to ride the 10 foot Greg Noll. There was another surfboard that emitted a sound as it skimmed the waves: a clearly audible hum coming from the fin located at the rear of the board, a vibration known as the Von Karman Effect (a phenomenon understood later when I studied fluid dynamics as an engineering student in London). The Ahangama outing was followed by a surfing trip nearer to home, in Moratuwa. By now the word had spread and the gang of three young Sri Lankan surfers had grown in numbers with others in the close-knit aquatic sporting community eagerly coming on board. Meanwhile, our horizon was widening. From Mount Lavinia we graduated to locations further down the coast. Surfing trips were now regular weekend affairs. We would gather at dawn on a Saturday or Sunday morning and head south, checking out waves in Moratuwa, Pinwatte, Paiyagala and Closenberg Bay, Galle. Mike was not able to join us on all the trips, but he would very kindly make his surfboards available. Mike finally stopped the surfing activity altogether and we all missed him very much. A few years later he chose to lead the life of an ascetic and lived that way until his death. Our means of transport for travelling to surfing spots were either Faiz Ahmed’s mini-van, with four boards strapped on the roof and the gang packed inside, or Anil Amarasekera’s trusty Land Rover, which was a bit more spacious. The sun would be coming up behind the tops of coconut trees as we trudged towards the beach, past local residents going about their morning ablutions. Children would greet us with cheerful shouts: “kalu suddho enavo” (black whiteys are coming). This was because we were bare-chested Sri Lankans clad in beach shorts and wearing rubber sandals, the kind of look only foreigners would affect. When the surf was good, we would be out at sea for a good three to four hours. At the end of an exhausting but thrilling session a very tired and dehydrated group of surfers would rush to the nearest milk booth - often drinking the booth dry. It was a big thrill to know that we were the very first local surfers in the country. We would get into furious competitions as to who would be the first to perfect the various styles and manoeuvres surfers perform on their boards while riding a wave. I wanted to be the first to stand on my head. This was accomplished after several attempts, but the experience lasted only a few seconds and was never repeated. I rolled off the front of the board and the back end tipped over and whacked me on the head as I surfaced for air! Pinwatte became our preferred surfing destination, because of its proximity to Colombo. Anil used his persuasive charm with the Pinwatte railway station master to store our surfboards in his house. When no vehicles were available, some members of the gang would go surfing by catching an early-morning train and get off at Pinwatte station. Jan was amused and promptly engaged the politician to explain the cultural diversity of the group. "He's a Muslim," he said (pointing to Faiz), "He's a Tamil (Niranjan), these two are Sinhalese (Anil and Asita), and I'm a Burgher." The confused and embarrassed politician quickly went his way. With increasing experience at sea came increasing recklessness. Closenberg Bay, in Galle, one of our favourite destinations, is ringed by granite boulders. Rather than taking the time to paddle out from the beach, we would often clamber down the steep slope by the side of the Closenberg Hotel premises and jump off the rocks into the sea. This was no small feat when you were carrying a board 10 feet in length and weighing 40 pounds, and timing your leap to the split second before the next wave struck. This radical Closenberg rock descent was abandoned after Jan Prins narrowly missed being seriously injured when a wave caught him just before he made the jump. His plunge had been delayed by a few critical seconds when the board got stuck between two rocks. When Jan abandoned the board and dived into the approaching wave, the surge dragged him back onto a rock. Luckily, it was smooth and generously rounded and his back collided with the rock while the wave rushed on. Although dazed and bruised he scrambled up the rocks before the next wave struck. The precious board came through with a few “dings”, or ruptures, on its fibre-glass skin. As the ’60s drew to an end, the original gang broke up as many of the members headed overseas to pursue education and employment opportunities. The surfing continued, but less frequently. Eventually careers, marriage, parenting and other responsibilities took over, and the sun finally set on the gang’s glorious days of surfing in Sri Lanka. Sadly, this wonderful sport has never really caught on with later generations of Sri Lankans. A few locals living down south have learnt the art and practise it at Narigama, near Hikkaduwa, the best-known surf spot on the south coast. These youngsters have been influenced by Australian surfers who are regulars at this spot, and some of the more enterprising among them run surfing tours for Japanese tourists on the southern and eastern coasts of the island. There is a modern day twist to this surfing saga. When the tsunami hit Sri Lanka on December 26, 2004, it left little untouched wherever it struck, including our surfboards. Anil Amarasekera, guardian of the surf boards, had stored them in the garage of a holiday bungalow near Arugam Bay, one of Sri Lanka’s most famous surfing havens. The surge of water destroyed the garage and snatched away two of the boards and dumped them in a paddy field two kilometres away. The car in the garage ended up 10 feet in the air, wedged between two Palmyrah trees. The lost surfboards were subsequently retrieved - with hardly a scratch on them. If the gang ever decides to get together again on a beach somewhere in Sri Lanka, armed with surfboards, it would be a much smaller group, and the feelings of nostalgia would be tinged with sadder emotions. It would be more of an “in memoriam” outing. Five members of the crew are no more. They are the late Astika Botejue, Peter Dharmaratne, Gihan Jayatileka, Cedric Martensteyn, and Niranjan Sinnatamby. Those of us survivors from the original group include five who are now based overseas: Wendell Flamer Caldera and Jan Vanden Driesen (Australia), Jan Prins and Ananda Ranasinghe (United States), and the writer (Pakistan). Only Faiz Ahmed, Anil Amarasekera and Asita Tennekoon have stayed consistently within the shores of Sri Lanka. These days the only active surfers from the original gang are the two Jans - Jan Prins, who lives in Hawaii, a surfer's paradise, and Jan Vanden Driesen, who has settled in Perth, Australia, where surfing is a popular recreational pursuit. Meanwhile, others "have a go" at this wonderful activity whenever opportunities arise. Dayumn! I didn't even KNOW we had a 'surfing gang' in good ol' SL! theres a lot that we have here spiderwomen! haha..... are you a surfer as well? join us next time. That's a great story which fills in some of the unknown gaps about the early surfing sararis in Sri Lanka. 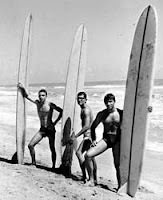 It's good to know that these guys actually existed in the 60's and that there was an original surfing crew at the time. Their intrepid antics and spirit will be honoured and respected by all of us in the recently formed Surfing Federation of Sri Lanka (Surfing Sri Lanka).